With the release of the Medical Device Regulation in May of 2017, medical device regulatory professionals have launched revision strategies spanning all levels of manufacturing organizations, to efficiently move into the transition towards compliance and meet the May 2020 deadline. Sixteen months later, many grey areas remain in the exact interpretation of the rules and regulatory body expectations, hindering the possibility of fully engaging in all necessary practical steps towards MDR readiness. In particular, notified body redesignation currently poses many challenges for the industry in need of organizing product recertification against the regulation, while the accreditation process has just recently begun. Overall availability of notified bodies remains a pivotal point of regulatory strategy updating for the industry, especially in the case of orphanage. Further, regulatory executives are evaluating how to best prioritize necessary actions left to take to efficiently use remaining time for transition, which implies fully considering dependencies and how updating one regulatory strategy will impact another to ultimately engage in the second half of a holistic and timely remediation strategy. 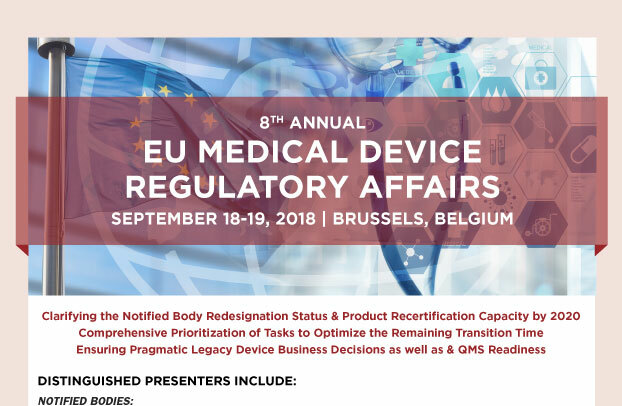 Following the success of the event series over the past seven editions, the 8th EU Medical Device Regulatory Affairs Conference will once more enable participants with actionable insight into industry strategies leading corporations to successful implementation of the new regulation. With practical workshops providing hands-on experience into prioritization methods, and peer to peer exchange group sessions in which participants have the opportunity to collect a maximized number of key perspectives, the event will ensure a high level of deliverables to attendees. Including insight from competent authorities, leading notified bodies and distinguished industry speakers, current areas of uncertainty will be broken down to pragmatic and realistic content, ensuring a clarified approach to the most pressing regulatory challenges, making this event the 2018 must-attend.